Throughout the project sustainability has been more than just a buzzword. 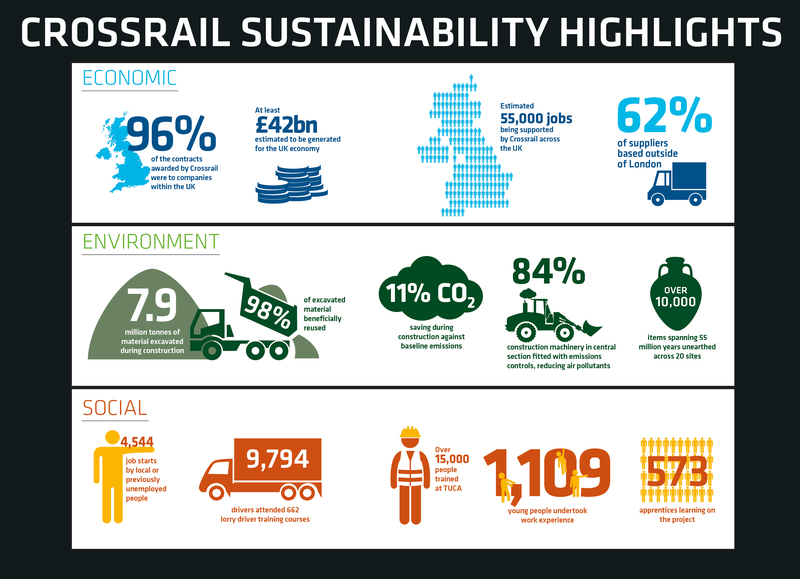 Crossrail has endeavoured to reuse, recycle or donate unwanted machinery, infrastructure and even earth. From four tonnes of bricks from the manor at Stepney Green that were donated to English Heritage for restoring Britain’s Tudor buildings, to over three million tonnes of earth that helped create the RSPB reserve at Wallsea, the achievements have been remarkable. In some cases large structures and buildings have been retained for reuse elsewhere such as a footbridge from North Woolwich, a pump house associated with the Connaught Tunnel and the 70ft (21.3m) turntable from Old Oak Common. More than seven million tonnes of soil, rocks and other material were removed! Over 98% of it was reused to create new farm or industrial land, as well as green spaces for local communities. Where possible all the tunnel boring machines (TBMs) were recycled. Many of their parts were sold around the world to be used in other engineering projects. Parts of Ada and Phyllis were buried near Farringdon as they could not be removed. Tens of thousands of objects were excavated from the Crossrail sites, with just over 500 on display at the Museum of London Docklands from 10 February to 3 September 2017. With the exception of the amber and the early animal bones which have been given to the Natural History Museum, all these objects, along with thousands of records, images and plans are now part of the Museum of London’s Archaeological Archive, where they are available for future research.